Today, it is rare to read HR or management press without some mention of employee engagement and why it is important. This is largely because, at this time of increasingly commoditised products and services, it’s widely recognised that engaged employees can have a significant impact on how customers view organisations and their products and services. They will try harder to solve a customer’s problem. They will stay late to help a colleague with a deadline. They’ll answer the phone at 6:01 PM, even if their shift has just finished. 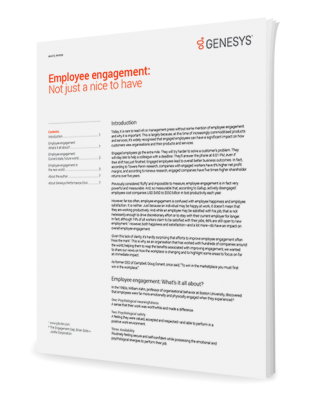 Engaged employees lead to overall better business outcomes. In fact, according to Towers Perrin research, companies with engaged workers have 6% higher net profit margins, and according to Kenexa research, engaged companies have five times higher shareholder returns over five years.